Heritage Place has announced format improvements and dates for their upcoming Yearling, Fall Mixed and Winter Mixed Sales. OKLAHOMA CITY, OK—APRIL 5, 2019—Heritage Place Sale Company, the premier Quarter Horse racing sales company in the US, announced updates to their sale format as well as updates to the their 2019/2020 sales schedule earlier this week. Heritage Place will continue to offer two great opportunities to sell "Yearling Race Prospects" in 2019, however the September Sale will now be conducted over two days and 650 head will be accepted. "This will allow all horses to be stalled inside (no tents or temporary stalls) and will highlight the finest of future race prospects offered," Heritage Place General Manager Spence Kidney said earlier this week. The 41st Annual Quarter Horse Yearling Sale will be conducted Thursday, September 19th and Friday, September 20th. "This schedule also allows owners and trainers to attend the Dash For Cash Futurity trials at Lone Star Park on Saturday (September 21), which has been a scheduling conflict and concern of our patrons for several years now. " Catalog fee for the September Yearling sale will be $600 per head and a 5% commission ($500 minimum). CLICK HERE to download a consignment form for the 2019 Heritage Place Yearling Sale. Additional yearlings will be featured in the "Yearling Session" of the annual 42nd Fall Mixed Sale set November 1st and 2nd. Yearlings, mixed age Quarter Horses, Paints, Appaloosa and Thoroughbreds will be accepted for the Fall Mixed Sale. The catalog fee is $600 with 5% commission ($200 minimum). "The Fall Mixed Sale will kick off with a 'Yearling Session' followed by the mixed session to complete the sale," Kidney said. CLICK HERE to download a consignment form for the 2019 Heritage Place Fall Mixed Sale. The 42nd Annual Winter Mixed Sale will held Friday, January 17th and Saturday, January 18th, 2020. Quarter Horse, Paints, Appaloosa and Thoroughbreds will be accepted. The catalog fee will be $600 with 5% commission ($200 minimum). 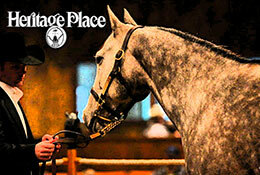 CLICK HERE to download a consignment form for the 2020 Heritage Place Winter Mixed Sale. "Heritage Place remains committed to offering the best place in the world to sell horses," Kidney continued. "We hope that these adjustments will enhance the customer experience and maximize the marketing of horses for our consignors." For additional information call the Heritage Place office at (405) 682-4551 or visit the sale company website at heritageplace.com.